The U.N. peacekeeping chief has urged the Security Council to take concerted action and “urgently” consider imposing an arms embargo on conflict-ridden South Sudan. He also reiterated the Secretary-General’s call from Monday for additional targeted sanctions on leaders and military commanders who are obstructing peace. “South Sudan’s never-ending cycle of devastating violence that has wreaked havoc on its people must come to an end now,” Ladsous said. Violence in the five-year-old nation resumed last Thursday, after forces affiliated with President Salva Kiir and first Vice President Riek Machar engaged in a deadly clash at a checkpoint in the capital, Juba. 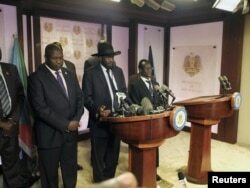 A tenuous cease-fire declared by Kiir and endorsed by Machar on Monday appears to be holding. South Sudan President Salva Kiir (C), flanked by former rebel leader Riek Machar (L) and other government officials, addresses a news conference at the Presidential State House in Juba, South Sudan, July 8, 2016. Since the clashes erupted, the government says at least 272 people have been killed, including 33 civilians, but the United Nations fears the toll could be much higher. At least 36,000 civilians are also estimated to have been displaced by the recent fighting; many are sheltering at two U.N. bases and churches in the capital. Wednesday, South Sudan’s newly appointed U.N. Ambassador Akuei Bona Malwal reiterated the government’s explanation for the cause of the fighting, saying opposition leader Riek Machar’s spokesman posted a false news story saying President Kiir had called a meeting at his presidential palace in order to “set up” Machar for arrest and possible harm. The ambassador said 21 mounted vehicles with bodyguards loyal to Machar came to the palace, accompanied by an ambulance that contained ammunition, to rescue Machar. This led to tensions between the two forces and a palace guard was killed in the chaos. Malwal said the transitional government remains committed to implementing the peace agreement. The Security Council will consider in the coming days whether to impose an arms embargo and how to respond to a regional request for more troops and equipment for the U.N. mission in South Sudan, UNMISS. France’s envoy, François Delattre, said the council can no longer “procrastinate” and must use all the leverage at its disposal, including an embargo and targeted sanctions on those who are responsible for the violence and obstruct implementation of the peace agreement. “There is the need, immediately, to impose an arms embargo, that’s long been the British position and increasingly it’s becoming position of others on the council, which I welcome,” British Ambassador Matthew Rycroft told reporters. 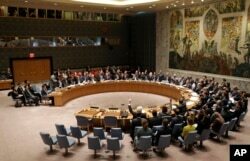 FILE - The United Nations Security Council meets at U.N. headquarters. When the idea of an embargo was first broached several months ago, some council members expressed reluctance about it because they feared it would hurt the government and favor the opposition, since it would be difficult to enforce.